Europe’s oldest Chinatown tells a slightly different story to that of its vibrant counterparts around the world; those alive and bustling with a supplanted Chinese way of life. Amble beneath its soaring gateway and you’ll find the Chinese street signs and restaurants set against an unexpectedly quiet road. The Open Eye Gallery’s upcoming exhibition Ebb and Flow recounts the stories of Liverpool’s Chinese community, tracing the area’s shifting landscape and demographic from the 1940s to the present day, as it oscillated back and forth between cultural vigour and waning fatigue. Liverpool’s Chinatown is home to a forgotten vein of the city’s history; the largely untold stories of the Chinese seamen that inhabited the city briefly before being forced to embark on one way voyages back to China. Bert Hardy’s images, commissioned in 1942 by Picture Post, capture the daily lives of these early inhabitants, recruited to support Britain’s war effort from the ports of the booming maritime Mersey city. 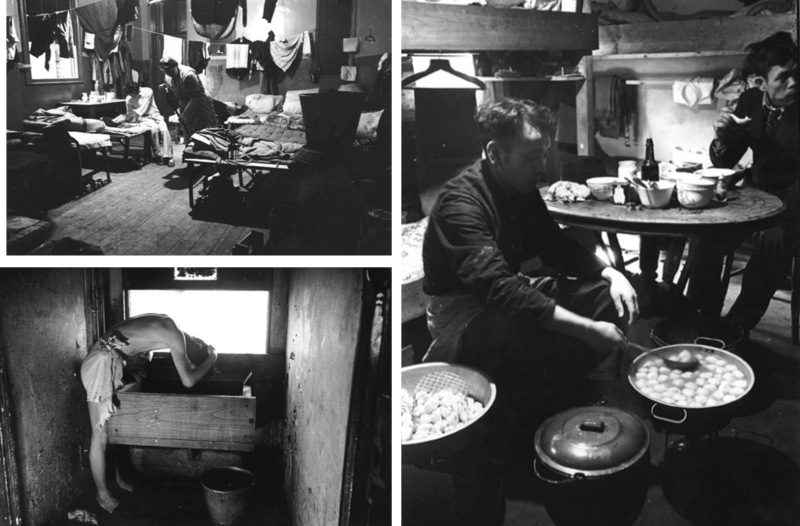 Not only do they document the poor living conditions these individuals faced, they also reveal the transiency of their early presence as they set up temporary lives in lodging houses and makeshift clubs, waiting for their next ship to arrive. Many however, chose to settle down with local, working-class girls and started families, attempting to establish a more permanent presence within the city despite their alien status. Their increasing demands for wages equal to those of local workers quickly posited the Chinese community as an undesirable, troublesome element amongst British authorities. With the end of the conflict in 1945, their work was no longer required and, needing to cut costs in face of increasing shipping competition, their pay was cut to a third of that of British seamen. The government’s eventual policy of repatriation saw the men returned to China, leaving behind a fatherless generation and mothers to contend singlehandedly with poverty and destitution. From the late 1950s, men from the rural villages of Hong Kong’s New Territories arrived in Liverpool, bringing with them their wives and children. The previously waning Chinatown of a bi-cultural, mixed marriage community gave way to a new population of Chinese families. Martin Parr’s work, commissioned by Open Eye Gallery in the mid-1980s, captured this succeeding stream of Chinese families entering the city. His images, depicting moments from their everyday lives, reveal a negotiation of cultures taking place throughout the community as they sought to make the city around them their permanent home. Liverpool based artists John Campbell and Moira Kenny bring together a deeply intimate archive of the community’s memories, with interviews, personal documents and photographs that recount experiences within the city, from the early ship workers to their grown up children. Their Chinatown Oral History Project aims not only to assimilate these memories into the city’s history, but to encourage the regeneration of the area, as seen in their recent bid to turn Britain’s only Chinese pub, The Nook, into the Contemporary Chinatown Museum as well as their visual comparison of the Chinatowns in both Liverpool and London, hinting at the area’s unmet potential. Today’s Chinese community has come a long way from the transitory sailors of its early days. With the opening of Xi’an Jianotong-Liverpool University in 2006 in Suzhou, China, the city has seen a new influx of professionals and students, contributing further diversity to the modern Chinese community. Jamie Lau has been commissioned by Open Eye Gallery to document the Chinese community as it is today, seven decades after Brett Hardy’s seamen. Never before having visited Liverpool prior to the project, Lau’s depiction of the city is constructed from the perspective of an outsider; an approach reflected in the detached, observant style of his work. His images slice through the darkness, cutting out the city surroundings and bringing only a single piece of architecture into focus. What emerges is a strange feeling of solitariness, despite the adjoining urban bustle. The city is depicted merely through fragments; ambiguous shop fronts and restaurants that are recognisable as part of the city only to those who have visited, or the discerning few that pass by and notice their presence among the dark cityscape. Previous articlephotographyAnd what of Nature Photography? And very love this club.